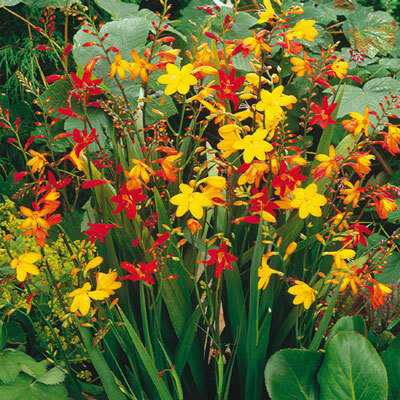 Elegant tubular flowers add a mix of vibrant colors to the perennial garden. Blooming in mid to late summer, the tubular flowers open on gracefully arched stems that are perfect for cutting. The swordlike leaves add a spiky, textured element to the garden. These bulbs look best when planted in clumps of a dozen or more. They may also be planted in containers. The non-demanding bulbs will come back year after year. 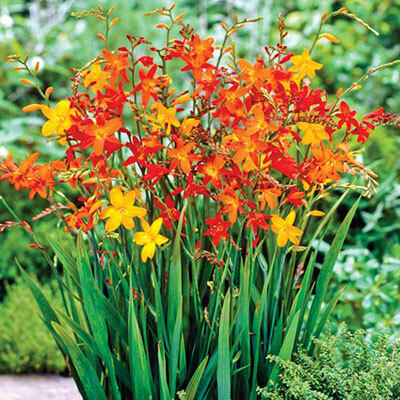 The name "crocosmia" comes from the Greek language and means "saffron smell," which reportedly can be detected when dried flowers are submerged in water.